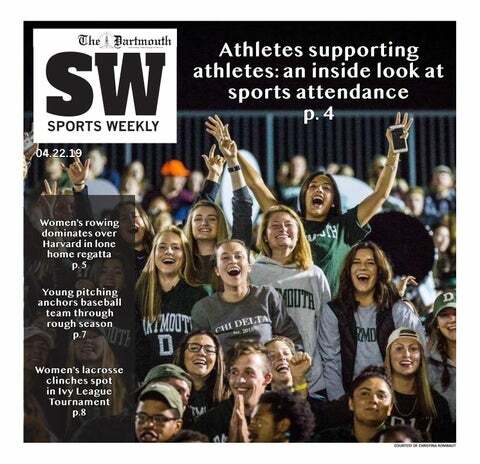 This week the Dartmouth sat down with rising senior Rachel Hand ’18 of the women’s rugby team. Hand has helped lead the Big Green to back-to-back Ivy League Championships for rugby 15s. In addition, she was a crucial player in the team’s win of the 2017 National Intercollegiate Rugby Association 7s Challenge Cup and the fourth place finish at the USA Rugby College 7s this past spring. Due to her impressive contributions, Hand was named co-MVP by coaches and fellow players. Apart from rugby, Hand is also committed to service work, investing much time in the Summer Enrichment at Dartmouth program. This summer Hand will serve as an assistant student director of mentorship for SEAD. What did it feel like to receive an MVP award last season? RH: It was really nice of my teammates and coaches to give me and my teammate Camille Johnson MVP awards for the year. Both of us and all of our other teammates have worked really hard to grow together and compete at higher levels. It was really humbling to receive the award and I am just grateful for my teammates and coaches who always push me to be a better teammate and player. Can you tell me about the development camp that some of your teammates went to this year? RH: It was actually a selection camp to compete on the USA women’s under 20 rugby team. There were girls from across the country from different high schools and colleges that were invited to try out. Three girls currently on our team were selected along with another girl who will be a ’21 next year so they’ll be heading up to Canada later this month to compete in a two game development series. Can you tell me a little bit about your work in SEAD? RH: I’ve been working as an assistant student director of mentorship for SEAD to help plan and run the program. I worked on recruiting other mentors, tutors, staff and faculty members to provide guidance for our 32 amazing 10th grade scholars. They are taking classes and participating in other fun activities at Dartmouth this summer to prepare them for college in a few years. I am currently working full-time with them and have loved connecting with them. What is your outlook on the team’s prospects next season? RH: I am so excited to see what next season will bring, especially based on our team’s growth last year. We are really lucky that we did not graduate any of our 15s players and have a great set of recruits. I really hope to win the Ivy Championship again and push even further in our NIRA Championship. We start off this upcoming fall with some tough competition like Penn State, Quinnipiac and Army so I hope that those games will help us prepare to play other great rugby teams in the future. What do you hope to accomplish during your last season at Dartmouth? What kind of legacy do you want to leave? RH: It’s sad to think about leaving, but I want to continue to bring positive energy to everything our team does on and off the field. I’d hope to bring the best out of my teammates and leave a legacy that continues to make hard work and dedication part of our team culture. I also just want this to be a really fun and competitive season and bond with our incoming class. What do you think has changed, if anything, when the women’s team transitioned from a club team to a varsity team? RH: When we shifted to become a varsity team, we got a new coach and have had a cycle of new players join and old players leave. So the past two years have been transition years. However, it has been great to push our team to be even more competitive while remaining a family.